National Cadet Corps (NCC) The National Cadet Corps is the Indian military cadet corps with its head Quarters at New Delhi. It is open to school and college students on voluntary basis. The National Cadet Corps in India is a voluntary organization which recruits cadets from high schools, colleges and Universities all over India. The Cadets are given basic military training in small arms and parades. The officers and cadets have no liability for active military service once they complete their course but are given preference over normal candidates during selections based on the achievements in the corps. 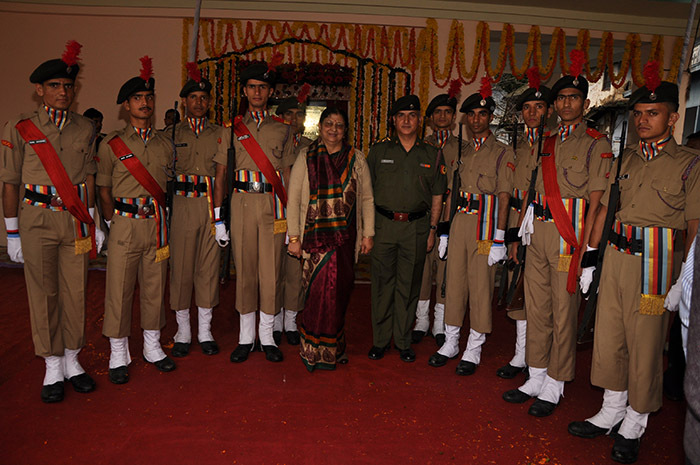 The NCC in India was formed with the National Cadet Corps Act of 1948. It was raised on 15 July 1948. The National Cadet Corps can be considered as a successor of the University Officers Training Corps (UOTC) which was established by the British Government in 1942. During World War II, the UOTC never came up to the expectations set by the British. This led to the idea that some better schemes should be formed, which could train more young men in a better way, even during peace times. A committee headed by Pandit H.N Conzru recommended a cadet organization to be established in schools and colleges at a national level. The National Cadet Corps Act was accepted by the Governor General and on 15 July 1948 the National Cadet Corps came into existence. During the 1965 and 1971 wars with Pakistan, NCC cadets were the second line of defense. They organized camps to assist the ordnance factories, supplying arms and ammunition to the front, and also were used as patrol parties to capture the enemy paratroopers. The N.C.C cadets also worked hand in hand with the Civil Defense authorities and actively took part in rescue work and traffic control. After the 1965 and 1971 Indo-Pak wars the N.C.C syllabuswas revised. Rather than just being the second line of defense, N.C.C syllabus laid a greater stress on developing qualities of leadership and officer-like qualities. The military training which the NCC cadets received was reduced and greater importance was given to other areas like social service and youth-management. To develop qualities of Character, Courage, Comradeship, Discipline, Leadership, Secular Outlook, Spirit of Adventure and the ideals of Selfless Service amongst the Youth of the Country. To Create a Human Resource of Organized, Trained and Motivated Youth, to Provide Leadership in all Walks of life and be Always Available for the Service of the Nation. To Provide a Suitable Environment to Motivate the Youth to Take Up a Career in the Armed Forces. * Regular Officers drawn from the three services of Army, Navy and Air Force. * Whole time Lady Officers. * Civilian StaffShip Modeling Instructors. * Rock Climbing Camps it is organized by specified Dt. * National Integration Camps (NIC) it is organized by specified Dt. * Thal Sainik Camp (TSC) it is organized by NCC HQ. * Army Attachment Camp (AAC) it is organized by solan unit . * Republic Day Camp (RDC) it is organized by NCC HQ. * Annual training Camp(ATC) it is organized by individual unit.